DUSHANBE (Avesta news agency) – The third meeting of the Tajik-Indian Joint Working Group on Combating International Terrorism was held on June 14 in Dushanbe. An agreement was reached on increasing counter-terrorism cooperation within the framework of the UN and the SCO. The sides also exchanged views on other mutually beneficial areas of Tajik-Indian cooperation. The Tajik inter-departmental delegation was headed by the First Deputy Minister of Foreign Affairs Nizomiddin Zohidi and Indian Deputy Minister of Foreign Affairs Mahavir Singh.Delegations exchanged national experience in the fight against terrorism and extremism and organized crime. 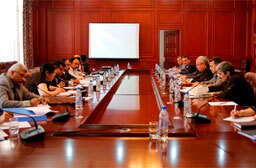 A constructive exchange of views on the assessment of terrorist threats at the national and regional levels was held. The sides were united on many topical issues related to ensuring regional and international security and noted the need for effective interaction of the relevant structures of the two countries in the antiterrorist and anti-drug areas. Common approaches to combating ISIS and the phenomenon of foreign terrorist militants are documented. In this context, the problems of radicalization of the population and measures aimed at countering terrorist and extremist groups in the information space were discussed. The Indian side offered to organize special training courses for specialists of Tajikistan in the field of combating international terrorism and ensuring information security. The parties agreed to hold a regular meeting of the Joint Interdepartmental Group in the city of New Delhi, the Tajik Foreign Ministry said in a statement.